Acai bowls rule! There it is, all you need to know. They are also, delicious and super nutritious, great for beauty, anti-aging, and health. I had one in Hawaii, and it was the incredible! I had it right on Waikiki beach so I’m sure that also had something to do with the experience. Now, there’s a new, really good acai bowl place in my neighborhood, but the granola they have are not gluten-free or raw. So I miss out on the granola which is a big deal for me. 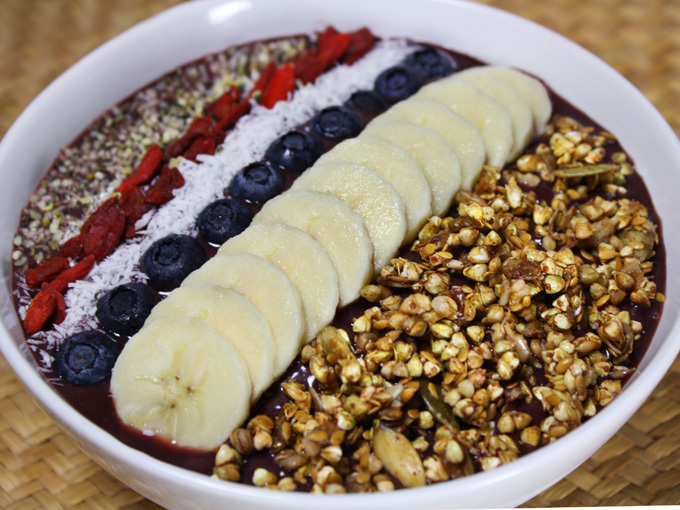 Of course, I had to make my own raw vegan acai bowl, so I can top it with my own raw vegan granola and whatever else I want without the extra charges! And you know, homemade is always best! Before I get to the recipe, a little about how to find acai. 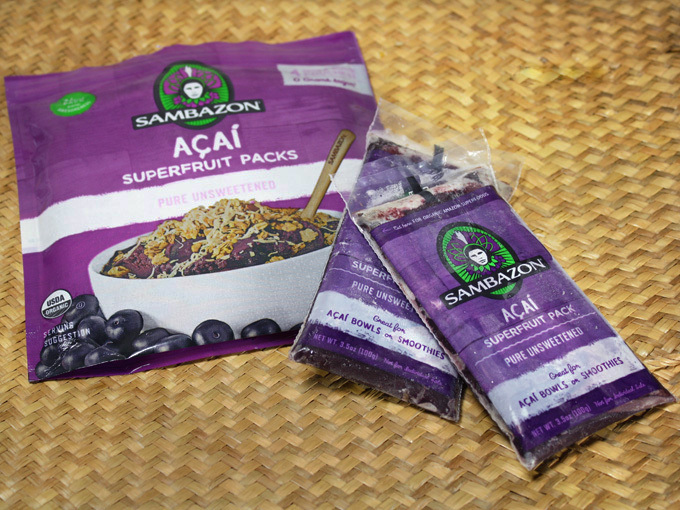 Since I don’t live in Brazil, and can’t get fresh acai, I use the frozen packs. It comes in unsweetened and sweetened, and you can find it in health food stores like Wholefoods, Sprouts, or even Costo! To make it raw vegan, I use the unsweetened one. But if you can’t find the unsweetened kind, you can get the sweetened one. I don’t always have the luck of finding the unsweetened one myself, and opt for the sweetened one. Keep in mind, acai by itself is not sweet, so it needs some sweetening (I do it with bananas and dates). Breakup the frozen acai packs before you take it out of the packaging, and put it into the blender. Add bananas and dates if you are using the unsweetened acai packs, or just the banana if you are using the sweetened kind and blend until smooth. 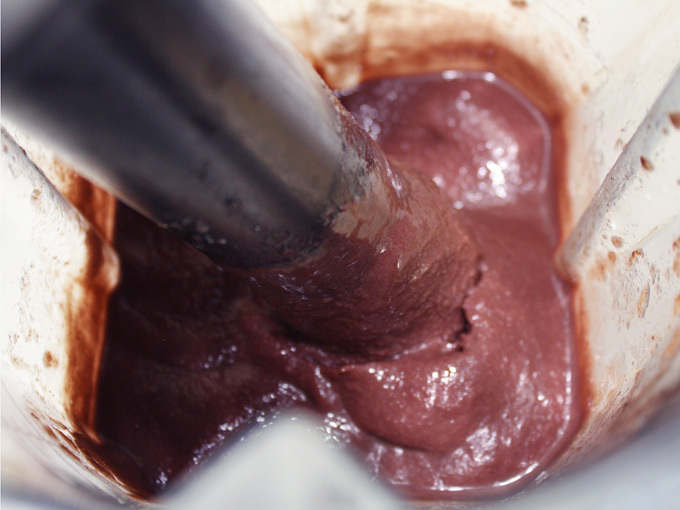 If you are using the Vitamix, use the tamper to jam the acai and banana into the blade to make it nice and smooth. If you are using a regular blender, you can add a little bit of water or almond milk to help it blend. Be sure to add only the amount you need to run it and no more, as if you over do it, you’ll end up with an acai smoothie. Though it’s great as a smoothie too! Well, that’s it for the acai part! Super easy! Transfer to a bowl and top it with granola, sliced bananas, and whatever you please! I topped mine with granola, sliced bananas, blueberries, coconut flakes, goji berries, and hemp seeds. After I took the picture, I dumped more granola and devoured it! 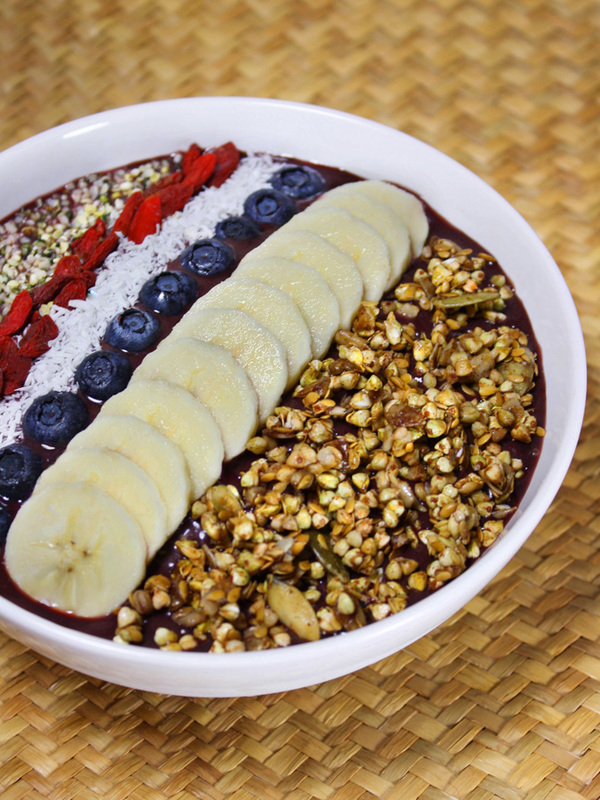 What’s not to love about acai bowls? Breakup the acai packs before you take it out of the packaging and put it into the blender. Add bananas and dates if you are using the unsweetened acai packs, or just the banana if you are using the sweetened kind and blend until smooth. If you are using the Vitamix, use the tamper to jam the acai and banana into the blade to make it nice and smooth. Transfer to a bowl and top it with granola, sliced bananas, and whatever you please! If your dates are firm, soak them in water until they get soft for about 30mins-1hour. If you are using a regular blender, you can add a little bit of water or almond milk to help it blend. Be sure to add only the amount you need to run it and no more, as if you over do it, you'll end up with an acai smoothie. 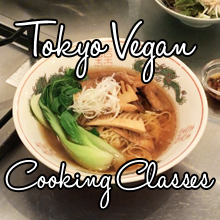 This recipe looks amazing and i was just wondering what blender you use for it? Also if the blender stick came with it? Hi Emma! Thank you so much for visiting my blog! I use Vitamix and the tamper (the stick thing) comes with it. The tamper really works great when you are blending thick things, and don’t want to add too much liquid to dilute it. It’s designed to not touch the blade, so it’s safe to use while running the blender. Vitamix is definitely not cheap, but it just literally creams everything and it’s built like a tank. I’ve had mine for over 5 years and abused it almost everyday, and there’s absolutely no problems whatsoever. It’s honestly the best purchase I ever made for my kitchen. I’m sorry for going on and on, I just love mine and highly recommend it, if you use a blender frequently. FYI, I think Costco has the best price for $375.